Rent Shoals Club on Bald Head Island | Corporate Events | Wedding Locations, Event Spaces and Party Venues. The Shoals Club is a relaxed, family-focused beach club, built for the enjoyment of Bald Head Island property owners and their guests. Whether you want to get married barefoot on the beach or under a gazebo overlooking the Atlantic, The Shoals Club has the perfect wedding and reception venue for you. The Shoals Club Events Division offers catering on-site at the Shoals Club. Wedding ceremonies can be held at the Shoals Club, on the beach near the Shoals Club, or at the Bald Head Island Chapel. The Shoals Club offers couples breathtaking views and a classic beach club setting for both ceremonies and receptions. 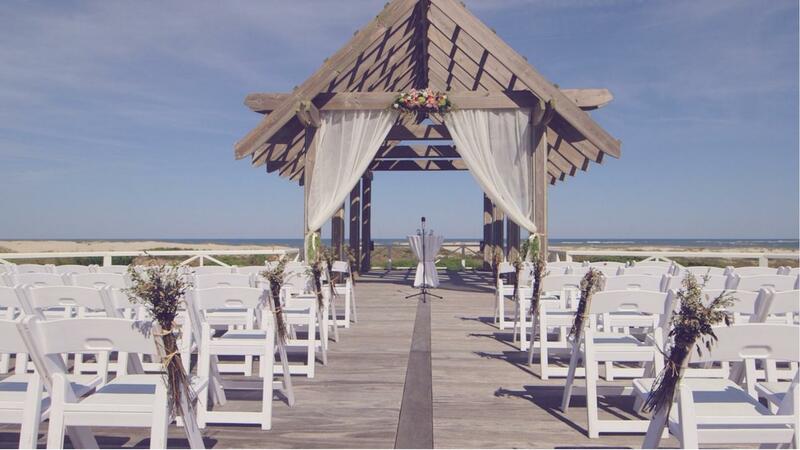 Most couples choose to have their ceremony on the presentation deck overlooking the Cape Fear Point and East Beach. From lavish wedding receptions to casual corporate retreats, the Shoals Club's Events Division can work with you to develop a customized menu that will delight your guests. Known for its Southern-inspired cuisine and regional seafood specialties, the Shoals Club relies on the freshest locally and regionally sourced ingredients. Sample menus are available when you contact the Shoals Club's Events Planning Division.